Science Resources, Reading Response, & the Weekend! Yay! The weekend is here! So much fun! My hubby and I took the kiddos to the grand opening of the new Nature Research Center, a new wing of the NC Museum of Natural Sciences. It was amazing. If you're close to Raleigh, I recommend going. We saw a scientist Skype with Jane Goodall about Chimpanzees. We also saw mosquito larvae eating under a microscope, and explored the amazing facility. One of my butter-beans played a game where he was a raindrop moving through the water cycle in the NASA sky & atmosphere lab. My other butter-bean was impressed by the fossil excavation lab, where she was able to vote for the name of an unnamed dinosaur. A museum volunteer passed along a resource for teachers: Elementary Globe. 5 science based storybooks and 15 classroom learning activities for students in grades K-4, including weather, water, seasons, and soils. You can order the books (which is not free), or download as PDFs and print or project your own. They also have resources for middle/high school science. Click here for Elementary Globe. Off topic... sorry! 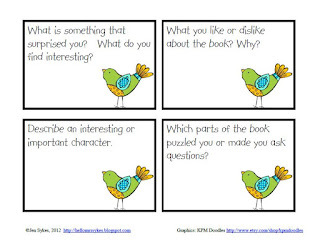 :) I had a couple of requests to create task cards from the Reading Response Prompts that I shared with you earlier this week. Click here for more information.